Need A Unique Gift? Give your would be comedian stand-up comedy training! Do you have a friend that wants to be a comedian or just isn’t that funny? Are you looking for the perfect gift for your family member with poor comedy timing? Then, let us help with these comedy training specials! Beginner Class with Gift Certificate and Workbook – $249!!! Call us at 415 921 2051 if you have questions or purchase online via the ‘make payment’ option on the right border! Watch Live Comedy at The Purple Onion at Kells!! The only full time comedy club in the bay area exclusively supporting the SFCC and New Comedy Talent! 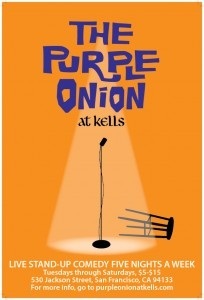 The San Francisco Comedy College (SFCC), the largest comedy school in America, is happy to announce the opening of its newest performance venue, the Purple Onion at Kells Irish Bar just around the corner from its old space at 530 Jackson Street in North Beach. Although the club was given a well-attended send-off back in September, the owners have given the San Francisco Comedy College the name of the Purple Onion for its new space in hopes of keeping the tradition of great comedy shows alive. “I’m really excited that the Purple Onion will live on,” says former owner Mario Ascione. In its new digs, the Purple Onion at Kells will feature stand-up comedy five nights a week with a variety of different shows. Every weekend at 8:30pm, “Headliner” will showcase the best performers in town. Tickets are $15. Like the Phoenix, the Purple Onion and its comedic prowess will forever regenerate and keep the laughs coming to its devoted San Francisco audiences. For more information, go to www.purpleonionatkells.com. The SFCC currently trains between 80 and 130 new comedians a month in San Francisco and prides itself on updating its curriculum and preparing students to compete in the larger comedy markets and comedy competitions worldwide. For more information, contact the SFCC at (415) 921-2051 or go to www.sfcomedycollege.com.